Ever wonder what Rodin's Thinker is actually thinking about? Well, like all of us, he's got a lot on his mind. 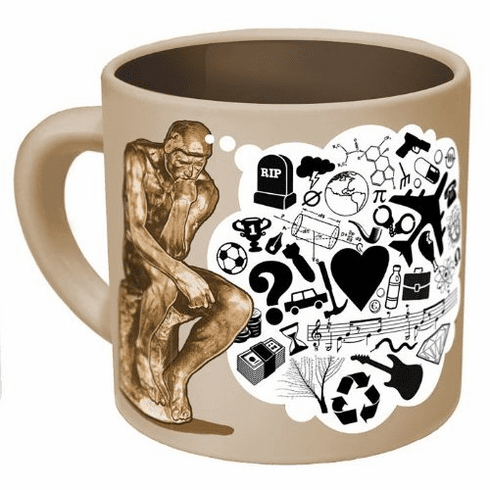 Our Thinker Mug shows all of the things he's obsessed with -- money, love, health, family, jobs, and on and on and on. But when you pour in hot coffee, something very special happens -- all of the things he's obsessing about vanish before your very eyes and are replaced with the solution to most of life's problems -- namely, COFFEE. We think it's pretty cool and maybe you should think about getting one!